2018 Season of Richmond Falcon Cam has Begun! 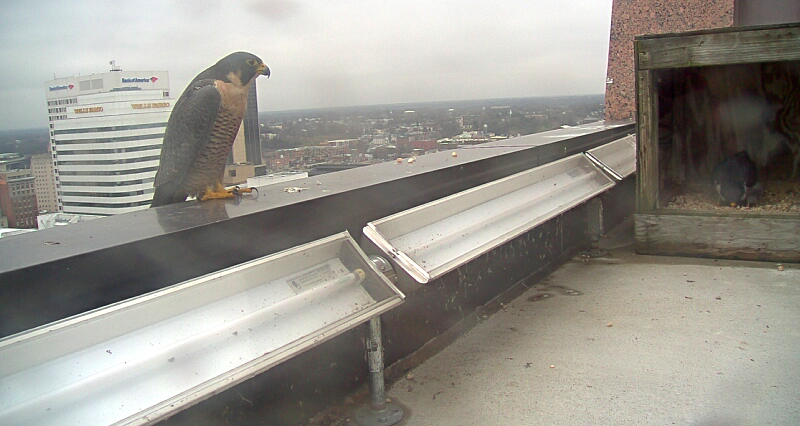 Welcome to a new season of the Richmond Falcon Cam. We are pleased to share that a male and female peregrine falcon have been observed at the nest box over the last couple of weeks. They have already have made a scrape in the nest box (a scrape is a shallow bowl-shaped depression in the substrate that forms a nest). The same banded male who has bred here over the years has returned–hatched in 2000, he will be 18 years old this year! (To date, the maximum lifespan documented for a banded falcon in the wild is just shy of 20 years.) However, the female we’ve observed is not the banded female that successfully bred here in 2017; she appears to have been replaced. The Richmond peregrine falcon pair together at the nest box on February 28, 2018. The male (left) is inside the box standing in the scrape while the unbanded female (right) stands atop the box. This year’s female is very buffy and unbanded and may be the same female that first paired with the male last season, prior to being replaced by the banded female who went on to breed. There are similarities in the plumage of the two unbanded birds, but also subtle differences, such that it is difficult to determine whether they are the same individual. Regardless of this female bird’s identity, we look forward to seeing how this breeding season unfolds! 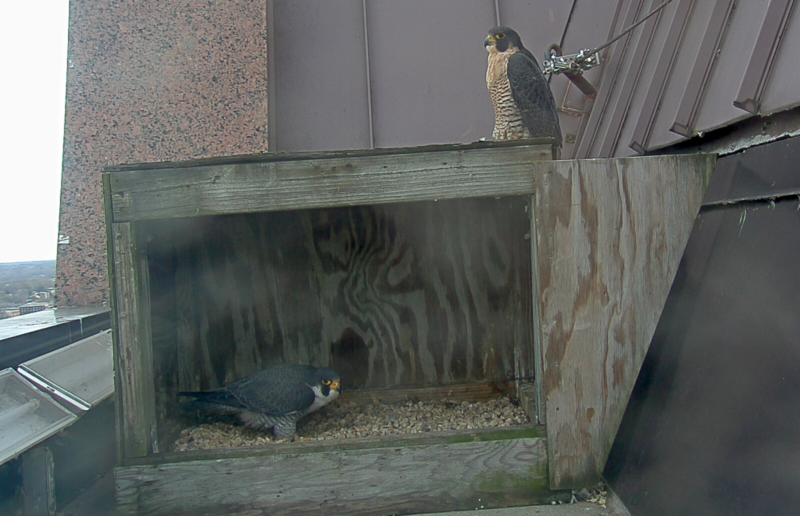 The male peregrine falcon (right) works on the scrape inside the box, while the unbanded female (left) looks on from the parapet on the afternoon of February 23, 2018.